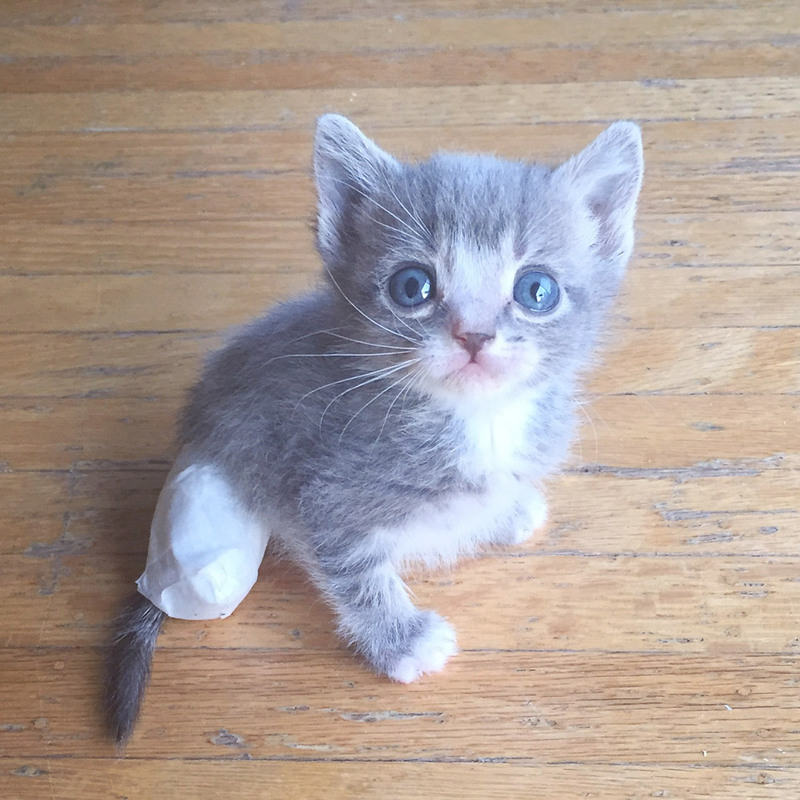 Tiny Long John Silver got his name because of his amazing silver fur. And because he’s missing part of his back leg. 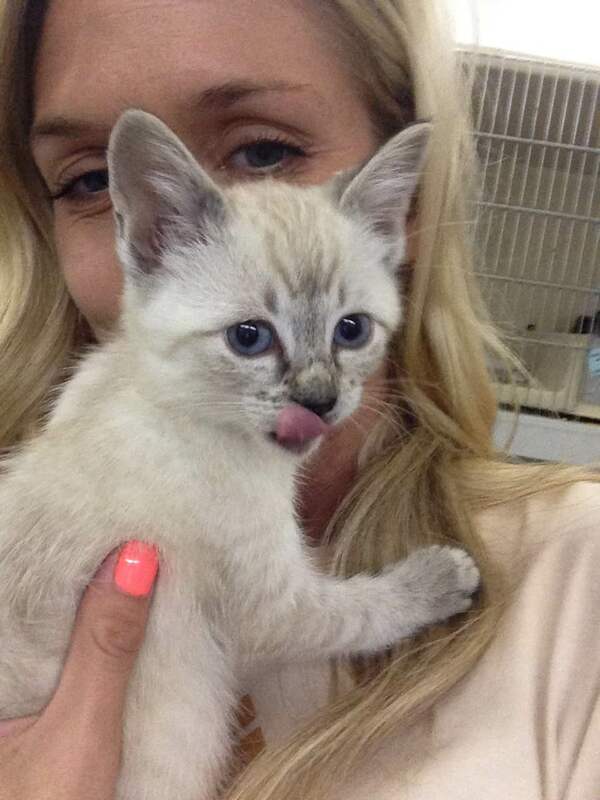 He was rescued when a woman in Port Coquitlam spotted a mama and two kittens emerging from a carport. The kind Samaritan took the little family inside but the mama begged to be let back out. Once outside she went back to the carport and one by one brought out five more kittens. We were called in and now the big family is safe and sound in foster care. Mom is very sweet and her mix of babies were likely no more than 4 weeks old when rescued. 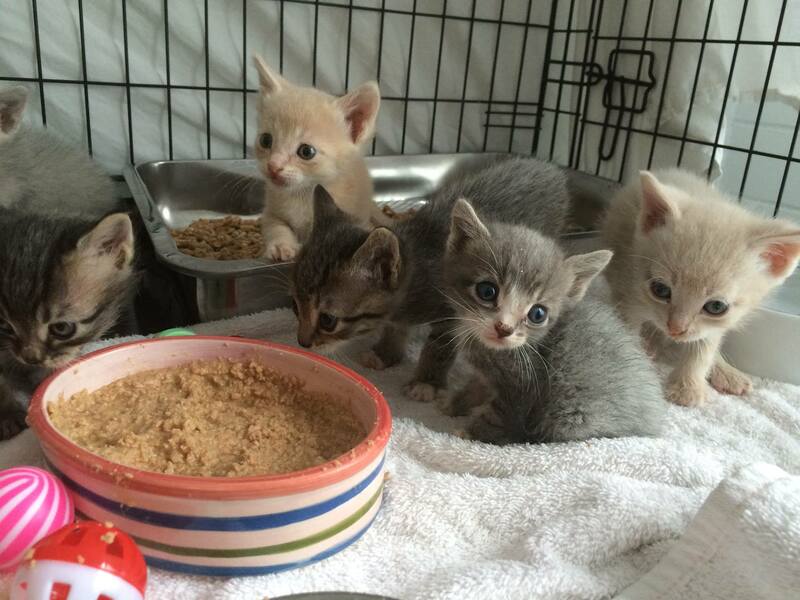 All the kittens are healthy except for Long John Silver who has a very damaged back leg and is missing his foot. The wound has been there for awhile and is infected, but with some TLC he’ll hopefully be able to live a normal life. He’s already made several trips to the vet though and the bills are starting to add up. But the good news is he’s healing really well and his wound is slowly closing over. 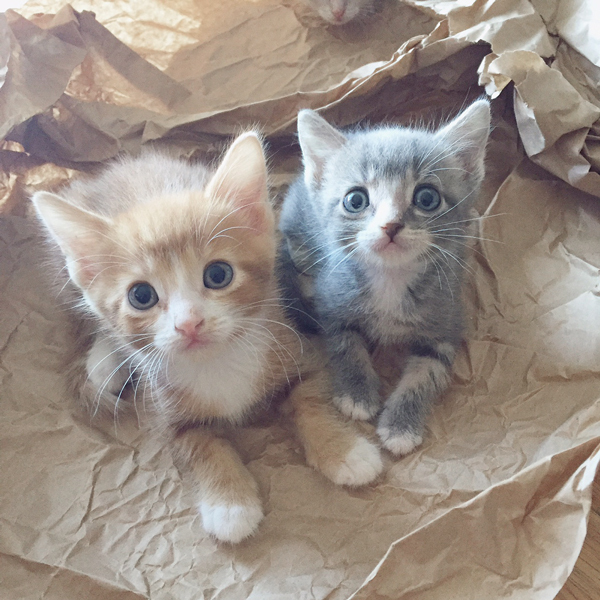 The reality is only 25% of kittens who don’t receive human care survive. The chips were stacked against Long John Silver and with his wound it’s certain he wouldn’t have made it without our help. Long John Silver is just one of the thousands of reasons why we Walk for the Kitties. 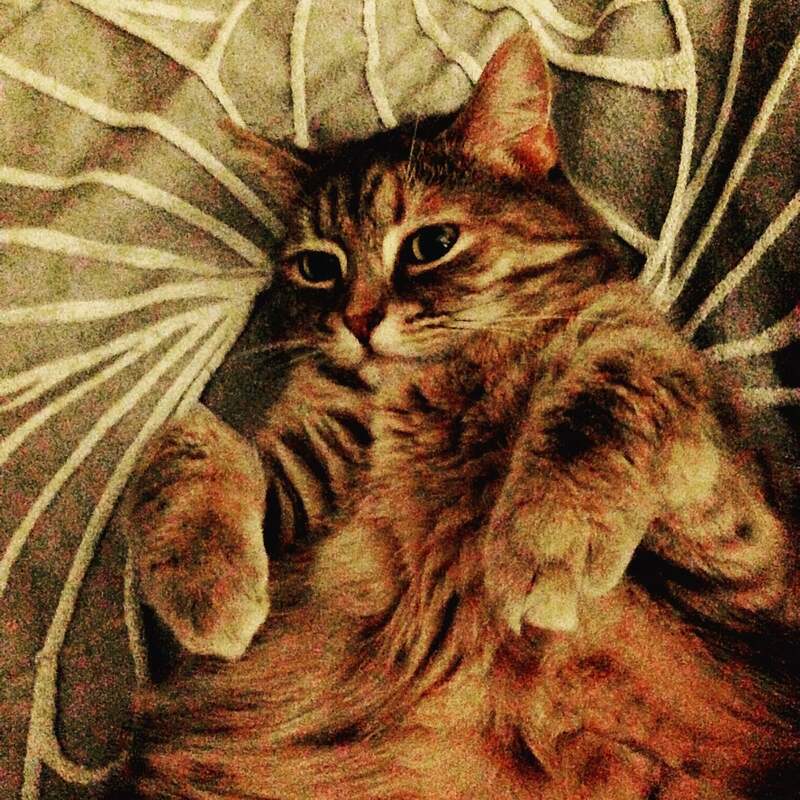 Each year, VOKRA rescues more than 1,800 homeless cats in the Lower Mainland. Unlike many other animal rescue groups, VOKRA is a volunteer-driven, no-kill organization. Our work is made possible through the generous support of volunteers, adopters and people like you. Walk for the Kitties is our largest fundraising event of the year and we rely on the funds raised. Learn more here. Please help us help kitties like Long John Silver this September 18 by joining us for our 7th Annual Walk for the Kitties. 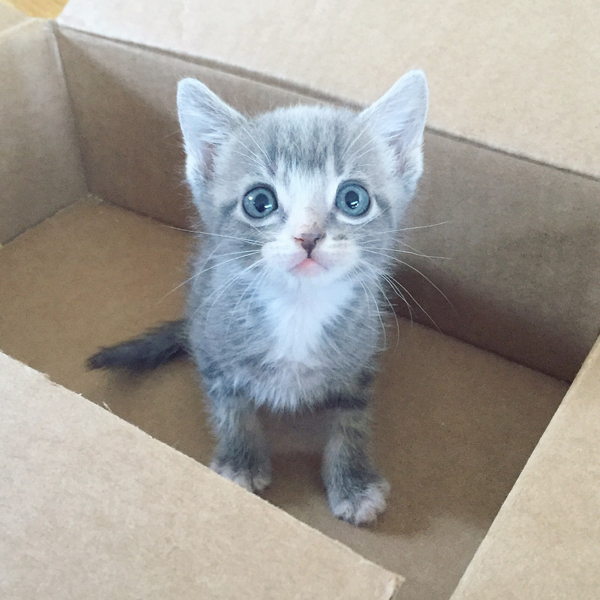 LJS loves boxes! Here he is with his brother Mr. Smee. Senior kitty Snaggletooth first came to us in July 2015 as a stray. At some point in his life someone cared enough for him to ensure he was neutered and tattooed. But by the time he came to us the tattoo had faded and couldn’t be read so he was stuck with us. He’s a sweet, loving, relaxed guy and sometimes his bottom left tooth ends up being in front of his upper lip so we dubbed him Snaggletooth. Life on the streets was rough for Snaggletooth and it took it’s toll. He had high blood pressure, a heart murmur and was mildly anemic. But with some care and attention he was doing well, until disaster struck. In April Snaggletooth failed to land a jump and severally broke his right back leg. In fact he broke it so badly a specialist had to come in to install a plate and pin the leg. But Snaggletooth is a resilient guy and he recovered nicely from his surgery and by June he was ready to find a forever home. That’s when something special happened. 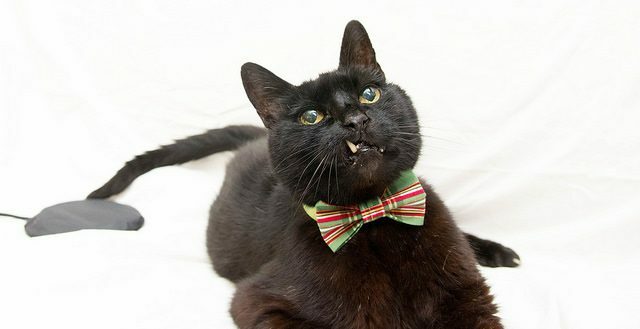 We featured Snaggletooth on adopteez.com and shared the post on our Facebook page. His profile ended up showing up in the news feed of a woman named Jen who automatically recognized him as the cat she lost more than a year ago. She contacted us right away and we were able to confirm Snaggletooth is indeed her kitty. It turns out he’s actually 19 years old and she’s had him since she was seven. It also turns out his name is actually Ramsey and he went missing shortly after they moved to a new home. Our best guess is after he escaped he was trying to make his way back to his old neighbourhood when we trapped him. We’re so happy these two have been reunited! Our reception team works at our Operations Centre in East Vancouver and is the first point of contact for all our visitors and guests. 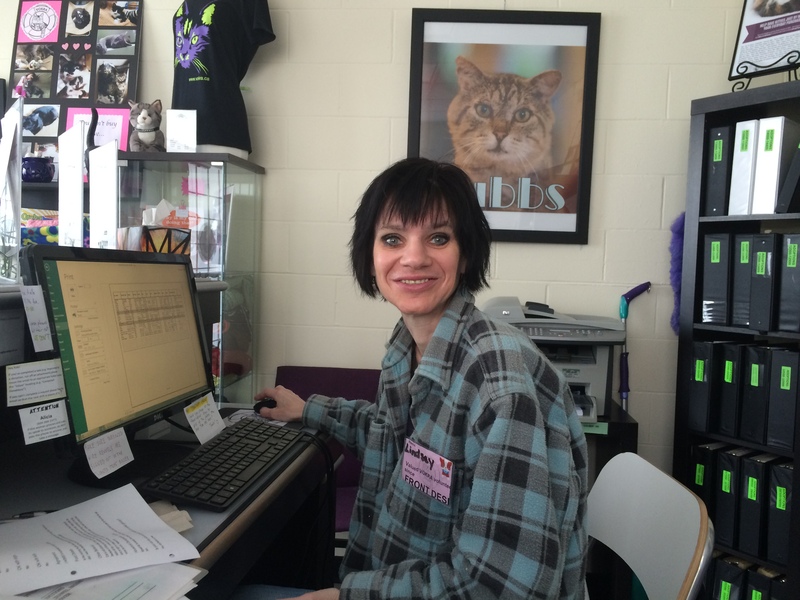 In addition to greeting visitors and acting as the face of VOKRA, the reception team also helps with data entry, filing, ensuring volunteers sign-in for their shifts, managing food/litter inventory, selling VOKRA merchandise and, most importantly, cuddling with our beautiful kitties! The reception team makes sure our Operations Centre runs smoothly which is critical. The Centre is our home base and is the place where kitties first enter our system and it’s also the hub for our foster program. Reception team volunteers must commit to a minimum of one 2 hour shift per week for at least six months. To apply to join our reception team click here. We hope all our volunteers had an amazing time at our Volunteer Appreciation BBQ last month! Now we’re back to our regular Volunteer of the Month feature and for August we’d like to give all our thanks to Natasha Wodak! 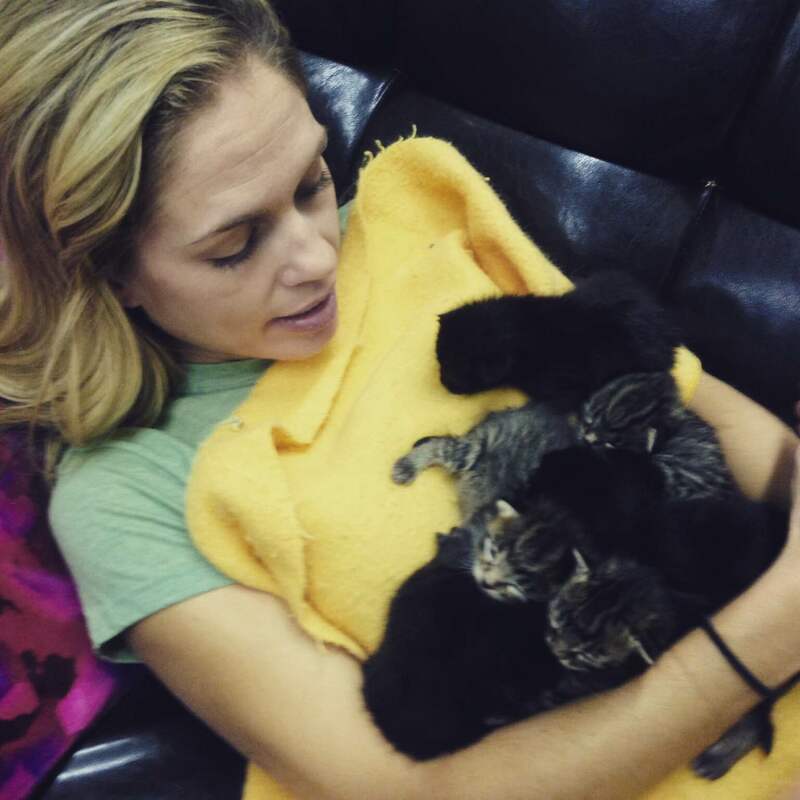 The hardest part about volunteering at VOKRA for Natasha is seeing all of the neglected, abandoned and abused cats. However, the most rewarding part about volunteering is knowing what a difference all the volunteers make for these cats; more than a thousand kitties are saved each year! 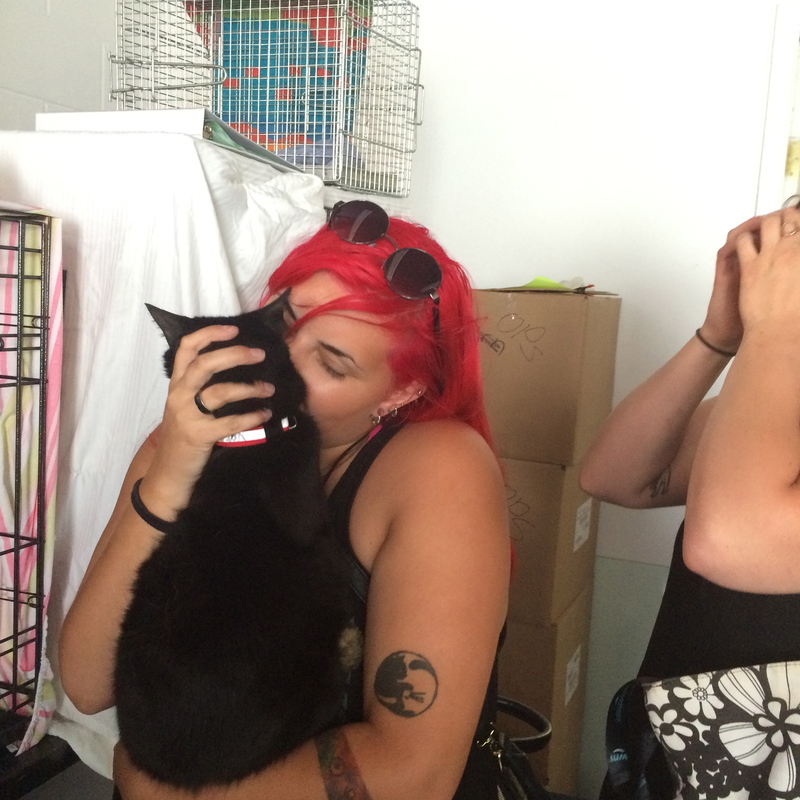 It makes Natasha extremely happy to know she’s helping all the helpless kitties in every way she can. She also loves taking photos of all the cats and kittens she works with, so check out her Instagram at @tasha_wodak if you want to melt from all the cuteness (and follow her Olympic experience)! We want to thank Natasha for all her hard work and devotion to VOKRA, even with her busy schedule as a professional athlete. We also want to wish her the best of luck at the upcoming Olympic Games in Rio. She’s one of the most kindhearted volunteers we know and she most definitely deserves an Olympic medal. 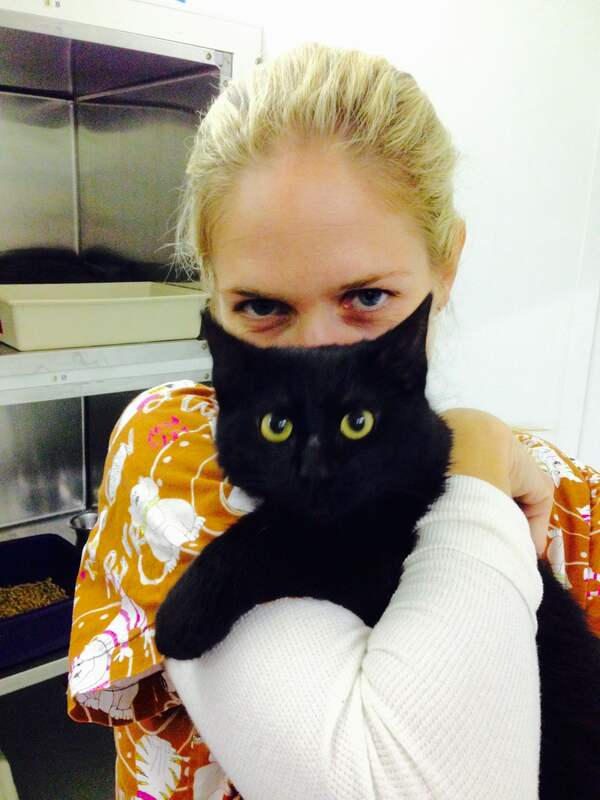 So again, good luck Tasha in Rio – do it for the kitties! You can cheer on Nastasha as she competes in the Women’s 10,000m on August 12 at 7:10 a.m.!